Did you unzip them first? Which plugins have you tried? teamspeak-server-plugin and online now they both were unzipped. So they don't appear in the Dashboard? What about under the disabled tab? Enabling or disabling clears Vanilla plugin cache which will show you all plugins with correct information. Your problem now is that you wouldn't be able to enable it! to any of your currently enabled plugins and delete it right after you've reloaded any of your forums pages. R_J How do I enable the plugin in the first place if no plugins show? 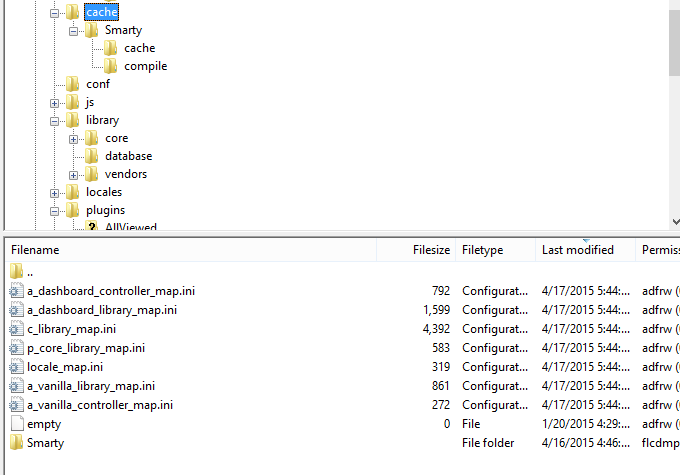 Have you checked the file permissions of the folders and contents? Sometimes the obvious is worth checking before goign on a wild goose chase. 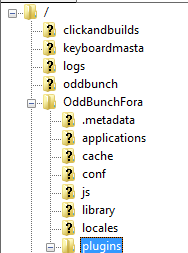 and the contents of the folders? You may need to 755 on some systems. make sure conf/config.php file is writeable. well what is the contents of these folders? what sort of hosting package are you on? I wonder if the directory truly reflects what is running on the server. 1and1 unlimited installed in free mode. Did you install Vanilla through a script? Not a fan, you are better of installing it following the installation instructions from the horse's mouth. yea >.> I might just have to do that seeing as I can not get it to work this way if it does not work still ill flip my proverbial table.